Settled on chaise lounges in the warmth of the sun, we watch as a battalion of hermit crabs in knobbly shells humps and bumps over ripples in the sand, marching inland; they freeze in place as I stretch my arms. A fashion show of butterflies sails from the jungle, across the sand of the half-moon bay and to the rocky headland. A flotilla of flying fish flashes past the bay like an extremely localized rain shower. As if escaping a frying pan, they barely touch the shimmering surface before skittering into the air again. Halfway to the horizon, five dolphins arc gracefully in unison. With a steady supply of limonadas (fresh-squeezed limeade), my husband, Eric, and I ooh and aah at each flash of color, each extravagant dance. 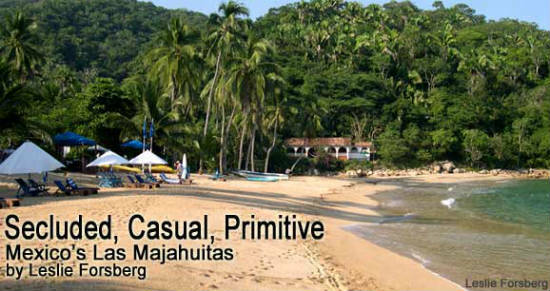 We are staying a skiff’s ride south of the busy Pacific Ocean resort town of Puerto Vallarta, at Las Majahuitas, which the Mexico Boutique Hotels’ online profile describes in three simple, telling words: secluded, casual, primitive. Secluded is right; the hotel is situated miles from civilization on its own golden-sand bay, its back to the shady jungle. 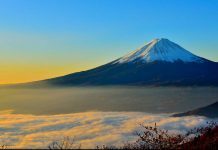 The only ways in and out are by boat or by a half-day hike up the foliage-cloaked valley to the nearest village. Casual means that even the manager is usually barefoot, and the most formal clothing might be a floral sarong for the evening meal. Primitive? Definitely. The hotel is off the power grid. Solar power only allows for the running of weak bedside lights, so candlelight is de rigueur, and “air conditioning” means the occasional slight evening breeze. But these words only skim the surface of our experience at Las Majahuitas, a collection of eight mostly adobe casitas linked by sand paths, that serve as the home base for outdoor adventures — snorkeling, swimming, kayaking and guided hikes. 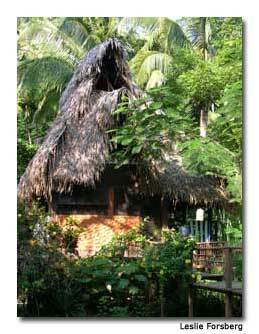 Accommodations range from a rambling treetop perch overlooking the bay to a thatched hut on stilts reachable by a bridge over a small stream. It’s this Robinson Crusoe–inspired open-air dwelling that we settle into after a breezy boat ride. I’m charmed by the hurricane lanterns positioned on posts beneath snarling jaguar masks, which at night will remind me of the simple childhood pleasure of holding a flashlight beneath your chin to scare a sibling. A four-foot-long (1.2 m) fake crocodile, jaws open, lounges in front of a couple of leather bucket-style chairs, appearing to be just relaxing before it slides down into the lagoon beyond the railing. In the bathroom, a gourd serves as the showerhead. And a selection of damp and moldering novels on a desk near the mosquito-netted bed give us a pretty good idea of the climate with one glance. Eric grabs a beach towel, water bottle and book, and heads out the door. “What do you want to do first?” I ask hopefully before he escapes out the door. He tosses me an ironic look and says, “Relax.” Hmmm … not one of my proclivities. OK, I’ll give it a try. I grab my book, towel, sun hat, and sunglasses, and follow Eric across the bridge, through the breezeway of the main building, and out to the beach, where bright white umbrellas sashay two-by-two across the gently sloping sand, shading chaise lounges. We toss our things onto a couple of chairs and dash down to the water’s edge. Eric strides quickly in and does a shallow dive, bobbing to the surface in the middle of the bay with a broad smile. I walk in and relax on my back in the buttery warmth of the water. I feel enrobed in silk, and oddly buoyant. I’m startled to notice my torso rising to the surface, my legs and arms bobbing near the surface. I’m more of the “sinking” type, yet the water here allows me to bob on the surface like a rubber raft, an experience I’ve never before had. I laugh and swim out to Eric to encourage him to give it a try, but the water doesn’t support his denser frame. As I settle onto my back again and listen to underwater clicks and fizzes, I focus on surrendering every muscle to the delicious warmth. As we climb out, we pause, balancing sideways like drunken sailors as the waves buffet us to and fro. Small, nearly translucent fish surround our ankles and bump against them in a strange human-fish dance that makes us giggle like kids. While Eric amuses himself with his latest mystery book, I grab one of the yellow sit-on-top kayaks and stroke out past the surf, heading along the rocky hillside south of the bay. Gnarly fingers of honey-colored rock jut skyward, basking in the sun, and small ravines are shaded by avocado trees. I stay a respectful distance from sections where the waves dash upward, streaming through rocky crevices before spilling back into the sea. A series of large-mouthed caves appears, so dark I can’t see into them. Waves rush inside with a deep growl. My curiosity is piqued, but it’s not safe to go sea caving alone. I hurriedly paddle back to the cove and encourage Eric to join me. We grab snorkeling gear before shoving off. As I pull close to the first cave, Eric points to our right: “Look! A hidden cave!” An inverted V-shaped entrance marks the side cave, which is nearly hidden by a rock wall. While I tend both kayaks, Eric tumbles off his kayak into waist-deep water and sloshes into the cave. He has a deep tan; as he’s wearing a black T-shirt, all I can see is a Cheshire cat grin in the darkness. We put on snorkeling gear and take turns turning lazy circles in the clear water, spying puffer fish, neon tetras, and a red-and-green mottled fish I’ve never before seen. Suddenly, Eric gestures excitedly and grabs my arm. “I want you to see this!” he says, as he guides me overtop a small round lump six feet (2 m) down. It looks unremarkable, the same as other bowling-ball-sized rocks scattered on the sea floor. “It’s an octopus!” Eric announces. “Are you sure?” I ask, dubiously. “Yeah! I didn’t notice it until a fish poked at it and it moved.” I continue to watch the lump, but there’s nary a sign of life on my watch. We arrive back at the bay with only minutes to spare before a gong summons us and other guests to lunch, served at linen-topped tables among palms. A Mexican-style smorgasbord of the sea ensues, with plates bearing minced shrimp salad, octopus salad and a whole fried fish. We settle into a daily routine of diving into waves, snorkeling for visual treasures and walking in the hushed jungle, where vines cling tightly to the trunks of immense trees and a small stream stains mud banks rust red with tannin. In the evenings, darkness descends suddenly as we get ready for dinner. We push open the wood door to the sight of hundreds of candles lighting resort pathways. The candles illuminating our bridge give me a dreamy feeling as I glide across the boards, drawn like a moth to the glimmering flames of a massive chandelier lighting a long table in the breezeway. This is where we spend hours laughing and visiting with fellow guests. On our last night, Eric and I reserve a romantic private table on the beach, lit by candles and sprinkled with crimson gardenia blossoms. I tuck one behind my ear. Lightening flickers in the distance, and a soft roll of thunder accents the chorus of crickets as we toast each other. Following a sumptuous meal of dorado with almonds, we stroll the beach in the darkness, a galaxy of stars shining above. Dots of neon-green phosphorescence wash up on the sand as the waves retreat. Eric cups his hands, delighted, attempting to capture a bit of the magic. As we stroll “homeward” across our bridge, the moon shines on the still waters of the lagoon and fireflies sparkle in the palm grove. Previous articleMonuments & Memorials: Remembering in Washington, D.C.